I have been meaning to write a blog for a while but you know how it goes. We put things off until tomorrow and then you get busy and think to yourself, I’ll get to it. So I decided that I can’t wait until tomorrow anymore, I need to do it now even if it is just a small post. There are so many things that go through my mind that I want to share! I know I can’t share them all in one post so I will try to make more of an effort to post regularly and share my thoughts. First of all, I want to thank you all for supporting me and Be Happy Stay Happy! I love the feedback I get from Facebook Fans! The tidbits of inspiration that you get from reading a quote or seeing a picture on there, brings me inspiration to keep going! You motivate me! 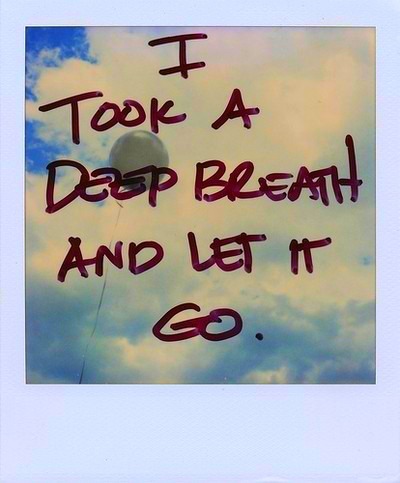 My thought of today is Let it Go & Just Live. Some of us tend to focus so much on what’s next & why, that we forget about now. We keep trying to figure things out, understand why something happened, or why someone treated us the way they did. Do you ever do this? Do you sit there and over-analyze a conversation you had with someone? You end up analyzing it so much that none of it makes sense and you feel worse. Well, I have seen some friends doing this lately and it gets them no where. All they do is waste their precious time trying to look for answers. We need to learn that we may not understand someone or something and that’s ok. It’s ok to let things go and accept the fact that people are the way they are. It doesn’t make them bad people it makes them different from you. Different is ok, actually it’s better than ok! If we all thought the same things or acted the same way, life would be boring. Take a look at the picture above. Visualize the problem you have as a balloon. When you need to let something go, visualize letting go of the balloon and watching it peacefully drift away. Take a deep breath and remember the Serenity Prayer. Sit back and try to let it go and just live! thank you. this put everything that’s been happening and my thoughts into order for me. makes me think i’m on the right path. these words probably changed my life AuthenticAng….. i love you for sharing this..